Provide comfort for the family of Cecilia Jackman with a meaningful gesture of sympathy. Cecilia H. Jackman, 95, of Fayetteville, passed away peacefully surrounded by her family. She worked for Onondaga County as a Home Health Aide. She was a communicant of Immaculate Conception Church in Fayetteville. 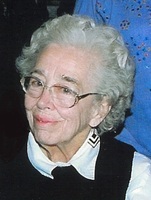 She was predeceased by her husband, Richard in 2011; her son, Richard in 2007; brother, James Holleran; and sisters, Frances "Franny" Godwin and Mary Winifred Kelley. She is survived by her daughter, Cynthia (Paul) McGinnis; sons, Paul (Sherry), David and John (Mary Jane); daughter-in-law, Jane Jackman; and granddaughters, Barbara Leigh and Alicia Anne; and great-grandson, Weston. Family and friends may call from 9:30 to 10:30 am on Monday, March 11th at Eaton-Tubbs Fayetteville Chapel, 7191 E. Genesee St., Fayetteville. A Mass of Christian Burial will follow the calling hour 11:00 am on Monday at Immaculate Conception Church, 400 Salt Springs St., Fayetteville. Contributions may be made to Immaculate Conception Church, 400 Salt Springs St., Fayetteville, NY 13066.